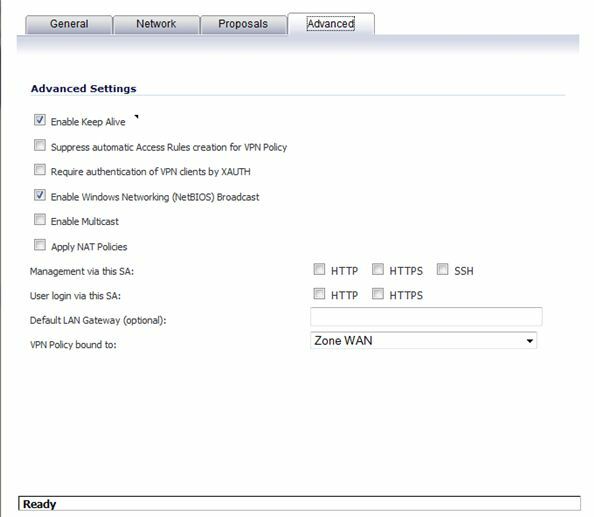 Setting up a Site-to-Site VPN is pretty simple in Sonicwall. Whether you have a dynamic IP connecting to a Static IP, or 2 static IP’s, its pretty simple to setup and you can have it up and running in no time. It’s as reliable as your internet connection and allows for quick failover to a backup IP address if one should go down. Here’s a quick write-up that will show you how to do it whether you have a 2 static addresses or 1 static and 1 dynamic address. Two Dynamic IP’s might require you to use Dynamic DNS or some other tool that automatically updates your IP address with a DNS server to make it appear static. For this write-up, I am connecting a TZ100 router to an NSA240 router. Quick Note: For a dynamic IP to static IP site-to-site configuration, use 0.0.0.0 as the “IPSec Primary Gateway Name or Address” on the static side because obviously the dynamic address will change. 1. To start on both Sonicwalls: Login to the Sonicwall, Go to VPN Settings page and write down both of your unique firewall ID. 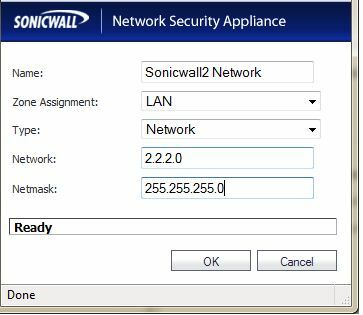 Lets call the routers Sonicwall1 and Sonicwall2 to keep things simple. For this writeup I’ve also kept it simple and put the Unique ID of 000000000001 and 000000000002, and IP addresses of 1.1.1.1 for Sonicwall1 and 2.2.2.2 for Sonicwall2 that way we know which one we’re talking about here. We will need it in a little bit. By default I believe this is the MAC address of your sonicwall. You might want to change this to something more secure. If not then leave it as the MAC address. 2. Now on Sonicwall one >> Click VPN Settings again >> and click Add Under VPN Policies. 3. Now we Enter our information on the General Tab. a. For auth. method use IKE using Preshared Secret. For the name put whatever you want, I put ConnectionToSonicwall2. b. 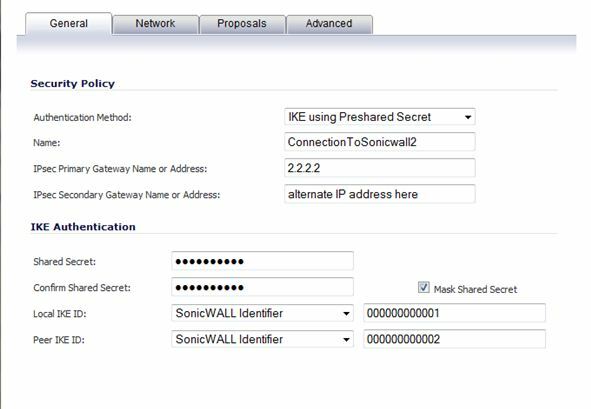 Set the IPSec Primary Gateway Name or Address to that of Sonicwall 2. If your Sonicwall2 has a dynamic address instead of a static address then enter 0.0.0.0 as the IP address. 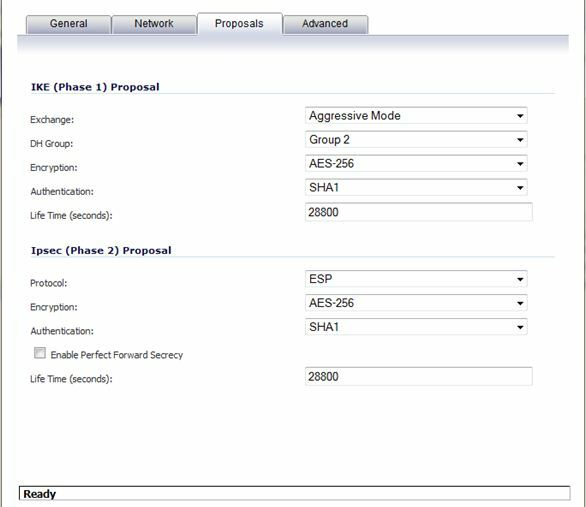 c. The Ipsec Secondary is the backup route to your Sonicwall2. This would be if you had 2 WAN connections on the Sonicwall2. If one of them went down it would automatically switch to the other line until the Primary becomes available again. 6. On the “Advanced” tab I checked “Enable Keep Alive” and “Enable Windows Networking ( Netbios) Broadcast and left everything else default. Click OK when you’re done. 7. Now we go to Sonicwall2, and basically enter the same settings reversed. 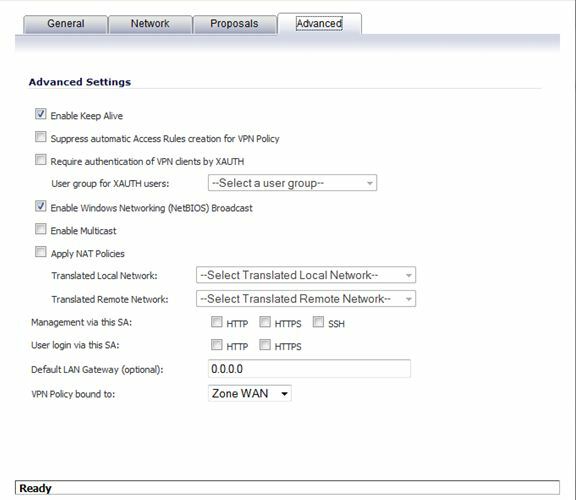 So Login to Sonicwall2 and go to the VPN Settings page and click Add under VPN Policies. 8. Now we Enter our information on the General Tab. a. For auth. method use IKE using Preshared Secret. For the name put whatever you want, I put ConnectionToSonicwall1. c. The Ipsec Secondary is the backup route to your Sonicwall1. 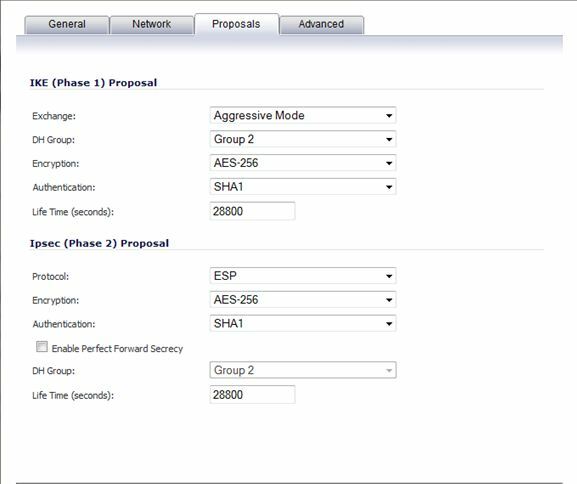 This would be if you had 2 WAN connections on the Sonicwall1. If one of them went down it would automatically switch to the other line until the Primary becomes available again. So if I had a failover on Sonicwall one of 3.3.3.3 then I would enter it here. 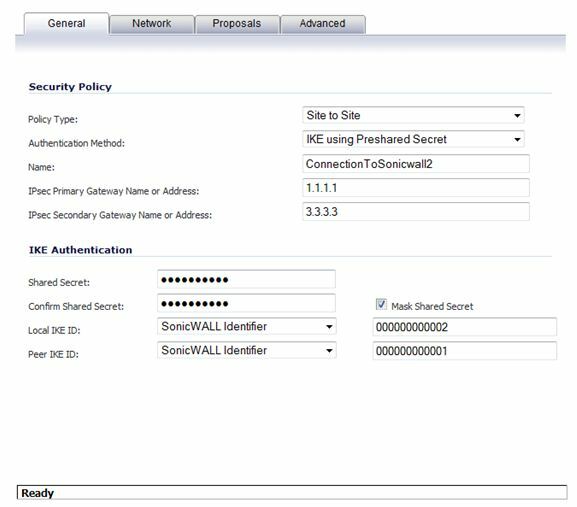 d. Enter the shared secret that you entered when configuring Sonicwall1. 11. On the “Advanced” tab I checked “Enable Keep Alive” and “Enable Windows Networking ( Netbios) Broadcast and left everything else default. Click OK when you’re done. That should be it. To see if it connected correctly, go back to the VPN settings page and see if it connected. There will be a “Green Light” to the right of Gateway under VPN Policies. If it does not connect then you may want to go the the Logs menu and under the filter category select VPN IKE to filter out only your VPN traffic. On both routers it will give you the reason it is not connecting, which can be cryptic. However, there are plenty of info on the errors you may receive if you Google. Before pulling your hair out, Go back and double check your settings to make sure that they match in areas like IP Address, Preshared Secrets, Sonicwall Identifiers, and the Proposals Tab. Also make sure that “Enable VPN” is checked on the VPN Settings page and make sure that “Enable” is checked on the VPN settings page next to your VPN policy or else it will not try to connect. I needed to have an anonymous share setup for access by some Windows workstations on a secure network. The key to this is “security = share” in the global config of the smb.conf file, because “security = user” always prompted for a windows password no matter what I did even if I added the user using smbpasswd -a. Hopefully this will get you up and running with samba in no time. It installs all the files in /usr/local/samba by default. The smb.conf needs to be in /usr/local/samba/lib. Other files like smbclient and smbstatus are in the bin directory. Here’s a simple smb.conf I have setup for sharing the /tmp directory. I grabbed part of it from an example in the untarred and unzipped directory I created above after downloading samba from samba.org. Just do a “find /root -name smb.conf*” to find example samba config files and copy it over to the /usr/local/samba/lib directory and modify it to suit your needs. A good resource is here. You should look into setting up domain security or something more secure than share security, for this writing, if you needed something quick and dirty this should work. Another thing you may need to do is to enable samba in your IPTables if your firewall is blocking ports 137-139. Here’s the entries in my iptables (/etc/sysconfig/iptables)to allow this. To get around this I ran the following command to configure SELinux to allow Samba connections. The above command allowed me to connect to this share and get rid of that error.